2017 was an important year of learning for Atheer - learning what our customers needed, how we could deliver the features and capabilities that addressed those needs as well as the kinds of augmented reality (AR) hardware they wanted to use our solutions with. So here are just a few highlights of what we learned in 2017 - and how we put that learning to use. When we visit with customers and they talk about tablet and phone-based solutions they have used, the challenges with their previous solution always seems to comes down to whether or not they have to stop what they are doing, switch into a mode where they are interacting with a device with their hands and then switch back to what they are really trying to accomplish. We understand that well - and that’s why AR solutions using smart glasses and AiR Enterprise software have been gaining such interest. We were inspired recently to see that this lesson has now been taken on board by one of the leading technology analyst firms - International Data Corporation - which articulated it concisely in a report about the long-term growth prospects of AR. IDC’s conclusion validates what we’ve heard from customers - it’s all about liberating their hands. Another key lesson we learned from customers is that they need choice - in hardware, system configuration and the way they interact with AR devices. As a result, we’ve made real strides in expanding the range of hardware for which AiR Enterprise is optimized. Atheer AiR Enterprise now for tablets! In July, we announced an Android Tablet version of AiR Enterprise for Samsung S2 tablets. “It provides our customers with the flexibility, scalability, speed and choice they need to bring together their physical and digital workspaces – using assets and technology they already have,” said Atheer CEO and founder Soulaiman Itani in making the announcement. We also expanded the range of smart glasses supported. 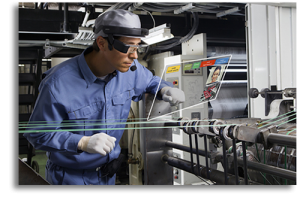 Typical of this work was the news in November that the latest version of AiR Enterprise is now supports the popular M300 smart glasses from Vuzix. The need for choice also extends to the way our customers interact with their AR devices. In the design of AiR Enterprise, we took the decision from the outset to make it “multi-modal” - meaning that there are a number of ways to provide input to AR devices using AiR Enterprise. You can use voice commands, provide “gestures” with your hands or make movements with your head. You can also use whatever the default mode of interaction is provided on your AR device. In September, we took an in-depth look at how customers make interaction choices in AR. We’ve heard this strongly from customers - and potential customers - throughout 2017. 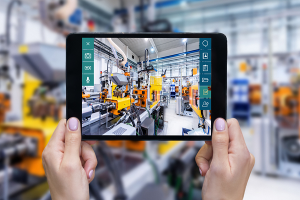 As soon as customers start understanding what AR solutions are capable of, they immediately begin to see applications for it within their enterprises. This enthusiastic response from customers has driven the creation of several eBooks over the last six months - each of which looks at the business problems facing a given industry, how AR can help solve those business problems and then how it can be implemented in a given sector. We now offer guidance for the aviation, automotive and manufacturing industries. Probably the biggest AR take-away in 2017 lies in the news that the impact of AR on your business is very measurable and very real. It should no longer be thought of as a “not-ready-for-primetime” technology that customers are just going to experiment with. Nowhere was that more evident than in the announcement last month by Porsche Cars North America, Inc. of its work with Atheer. 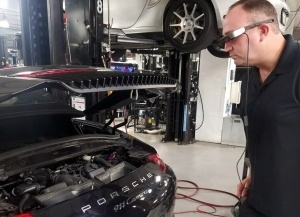 “When a service technician at a dealership in Los Angeles dons this specialized eyewear and connects through the software with the Atlanta-based Porsche technical support team 2,200 miles away, it allows the support team to see exactly what he is seeing, in real time. This "see what I see" video-conferencing capability with instant access to remote experts allows both parties to quickly identify and resolve technical issues. It can also help decrease service resolution time by up to 40 percent, based on the findings of a pilot program undertaken in July 2017 at eight Porsche dealerships in California, Florida, Indiana, New Jersey, and Washington, along with one in Canada. This work by Porsche is the way we see companies planning for – and measuring – the impact of their AR implementations in 2018 and beyond. We look forward to a productive and prosperous new year – and continually to be guided by the great lessons we learn from our customers and the way they use and help guide the development of our solutions.